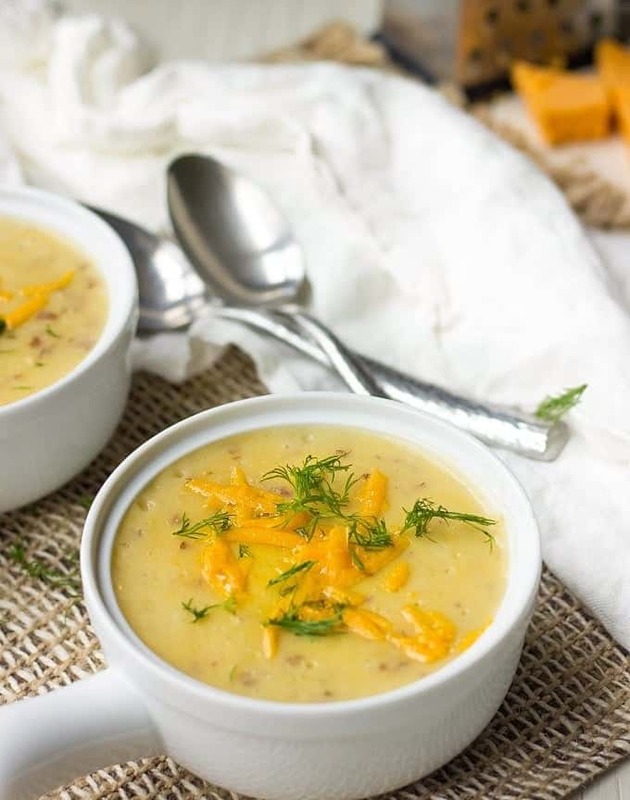 Roasted Potato And Garlic Soup is made in no time and filled with warm and comforting flavors. 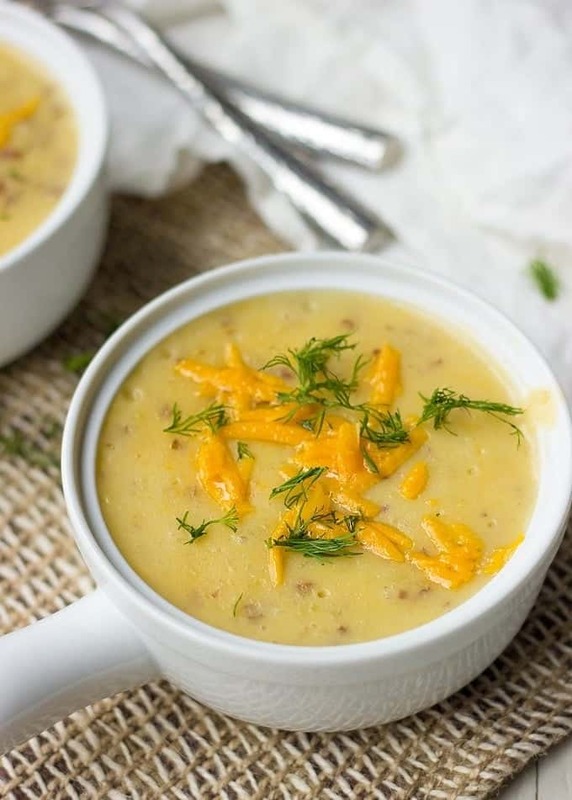 This easy soup will make you happy and your belly full during colder months. This past week it really started to feel like winter. As much I like different seasons and major holidays ahead, I don’t tolerate cold weather well. When the cold wind blows and it’s below freezing, all I want to do is curl up under the blanket, watch movies and eat comfort food. Are you with me? Speaking of comfort food, I’m definitely a soup person. I eat soups all year long but I eat them even more often during colder months. A bowl of warm homemade soup is always on my list of winter comforters. Recently I made a really easy Potato Soup that takes little time to prepare but tastes seriously delicious. I skipped peeling potatoes and roasted them with the skin on. There’s something rustic about it, plus this makes soup very colourful. Okay, enough with a potato talk. Have you tried roasting garlic before? I’m talking about roasting the whole thing when you cut off the top of the bulb, wrap in foil and roast until your kitchen is drenched with most irresistible aromas ever. If you said “no”, you’d better do it asap. Because this is a technique you will use over and over again to add mouthwatering flavors to any of your homemade soups. You can certainly call this soup a healthy one. I used only half a cup of half and half and 1 cup of cheddar cheese. Healthy plus delicious, call it a win! Trim the top off the garlic head, season it with salt and pepper and lightly drizzle with olive oil. Tightly wrap garlic in aluminum foil roast in the oven for 40 minutes. When ready, remove from the oven, carefully unwrap and let it cool. Place cubed potatoes on a large baking dish, season with smoked paprika, salt and pepper. Add 2 tablespoons of olive oil and give everything a nice toss. Roast for about 30 to 40 minutes until potatoes are soft when pierced with a knife. In a bowl of a standing blender, add potatoes, squeeze out garlic from its bulb by pressing on the bottom of a bulb. Add vegetable broth 1 cup at a time and process until all ingredients are blended. Add more broth if necessary to reach a desired consistency. Transfer soup into a medium pot and place on a medium heat. Add half and half and cheddar cheese. Cook until cheese has melted. Serve immediately and garnish with chopped dill and more cheddar cheese.